Do you know the best positioning for your computer screen? How many hours per day do you think you spend staring at a screen? Well, you may be shocked to find out that for adults in the U.S. that number is hovering around a whopping 10 hours per day! While this may sound shocking, it really isn’t all that farfetched once you consider that office workers spend most of their work day sitting front of their computer screens. Despite all of this, most people still don’t know the best position for their computer screen! Why does the position of your computer screen matter? If you fall into that latter group, it may not be the first thing that comes to mind, but the positioning of your computer screen is of major physiological importance. Eyestrain, carpal tunnel, neck pain, and posture issues are just a few conditions that may occur when incorrect positioning occurs. This is why correct positioning and ergonomics matter. Fortunately these problems can be avoided with a few simple practices. What factors should I be aware of regarding computer screen positioning? When it comes to acceptable screen positioning, that which is acceptable will vary slightly from person to person. This depends on their height, amongst other factors. Broadly speaking, any screen position that forces you to tilt your chin, or otherwise bend or tilt any part of your body, is incorrect. Such positions may not only cause the aforementioned strain, discomfort, and pain, but may also have an effect on your productivity. Viewing distance has everything to do with how far away you are from the computer screen. Too far away, and you’ll be unable to read the screen properly. Too close, and you’ll be forced to deal with eye strain. When it comes to effective positioning, the key is to find the sweet spot. Moreover, distance is not just an issue for the eyes. If too close or too far away, you may subconsciously begin to lean back or forward, or under/over-extend your arms. Point being, a small miscalculation in viewing distance can disrupt all your ergonomic efforts. In order to set up a perfect viewing distance, first be aware of ocular accommodation and convergence, which reference involuntary eye functions when too close to an object. These are what cause eye strain. To avoid this and other such issues, the resolution is quite straight straightforward. 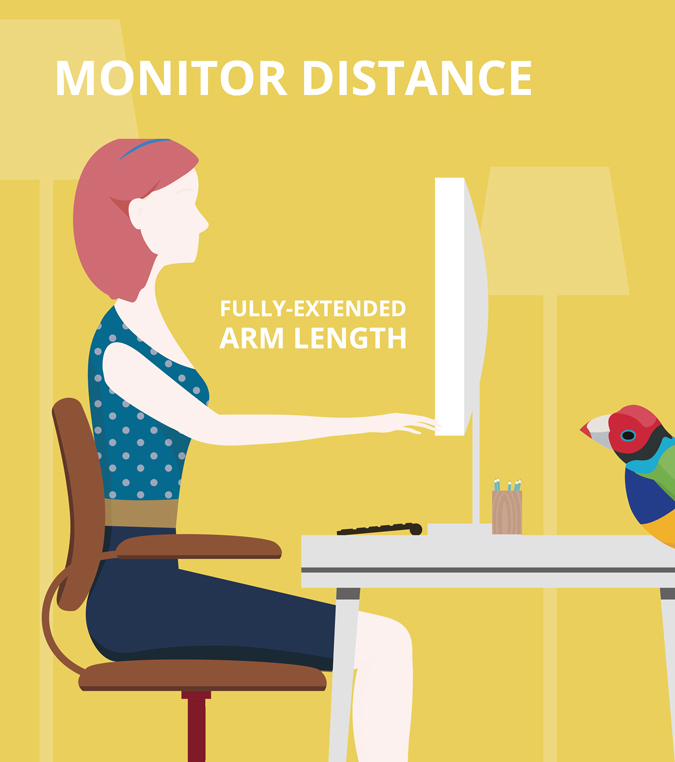 When sitting in front of the computer screen, simply place the monitor at the exact length equal to that of your fully extended arm. Because computer screen sizes vary, make sure to double check that the monitor is neither too close nor too far away. When done properly, you should be able to see the entire screen and work comfortably without straining your vision or moving any part of your body. 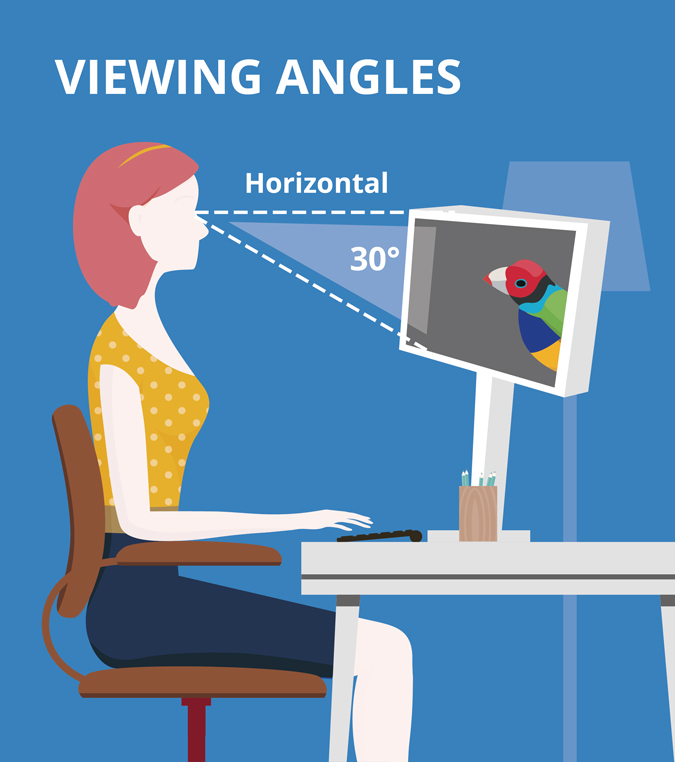 Not only should the computer screen be placed directly in front of you, but it’s also important to be aware of the angle at which you’re viewing it. Position your computer screen at a poor angle for long enough, and you could find yourself experiencing neck pain and possibly even damage. When it comes down to it, the screen’s angle is more or less its height in reference to the user. A six-foot-tall person should not have his or her screen at the same position as a five-foot-three-inch person, for instance. Getting into the numbers of it all, your screen should be placed anywhere between eye level and thirty-degrees below your line of sight. This range is determined based on the fact that our eyes naturally trend straight ahead and downward when at rest. Bearing that in mind, the trick to determining the angle that’s best for you, without breaking out the protractor, is remarkably simple. When gazing at a computer monitor, your eyes should be at rest when viewing a browser’s address bar. If that’s not the case, and you’re seeing the trash bin or upper toolbar, then you may want to adjust the angle at which you’re viewing the screen. Ergonomic monitor stands are workspace accessories that aim to take the guesswork out of proper ergonomic screen positioning. Complete with a retractable and tilt-able arm, the issues of angle, viewing distance, and glare are promptly made easy. By attaching your monitor to the stand, these tools will also assist with workspace organization. Ergonomic monitor stands attempt to provide ergonomic comfort to the greatest cross-section of monitor owners. Using a monitor mount like this ViewSonic ergonomic monitor stand will allow for a wide range of height and angle settings to help you more easily find the best positioning for your computer screen. Dual monitor arms, as compared to basic ergonomic monitor stands, are able to accommodate two screens rather than one. With all the same benefits are ergonomic monitor stands, the eponymous dual-aspect of these monitor arms are truly the point of interest. In the professional world, it has become increasingly common as of late to maintain use of at least two monitors. Dual-monitoring, it allows for a user experience akin to using a single ultra-wide monitor. As this trend has caught on, studies have shown that such set-ups have resulted in increased performance for the user. Ergonomically, dual-monitor set-ups should be treated the same as their single-monitor compatriots — proper positioning view distance, and angle are all still of equal importance. Broadly speaking the greatest determining factor in proper dual-screen ergonomics has to do with the ratio of use between the two monitors. Those that use both screens equally should treat them like they would a single monitor, with both placed straight-ahead and arm’s length away. On the other hand, those that use one monitor considerably more than the other should place greater emphasis on the one most used. To that end, the primary should follow proper viewing distance procedures. The secondary monitor should largely follow the same rules, but on an angle favoring your dominant eye. It is in this calculation that dual arm monitors, particularly this modular dual monitor arm by ViewSonic, can be of great use. What other factors should I be aware of regarding computer screen positioning? A computer screen’s viewing angle and distance are not the only factors that should inform positioning. Although a computer screen’s positioning may be perfect for your height, it does not take into account the effect of external light sources. Specifically, if you fail to heed the presence of windows and other sources of light, you could end up with a fair amount of glare. 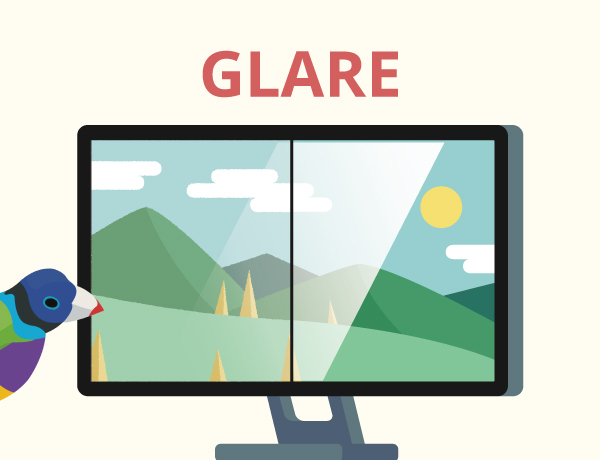 In certain scenarios, not only will glare cause eyestrain due to its inherent reflection, but also because of the shifts in position you might take to avoid it. When aiming to reduce possible glare, there are several steps you can take. First of all, you can change the screen’s tilt in order to mitigate effects from overhead sources. As a means of eliminating window-related glare, it is suggested that you place your screen at a ninety-degree angle from all nearby windows, or else that you make use of window shades. Ultimately, the presence is easily determined by turning off your screen. If glare is present, you will obviously see it all over your darkened screen. If you’ve already taken all possible steps to handle the glare and find it still present, then perhaps a third-party accessory is needed. Glare and light filters are often used for this purpose. Although your computer screen may be of proper distance from your seated position, it’s possible that you have not accounted for the influence of font size. Sometimes, even when all else is perfect, you might find yourself wishing that the screen was a bit closer so as to read a bit more comfortably. It is in this case that you may want to consider altering your font size. Primarily, it must be noted that in all situations, a font size increase or decrease will always be of greater benefit to your eyes than a change in screen viewing distance and position. 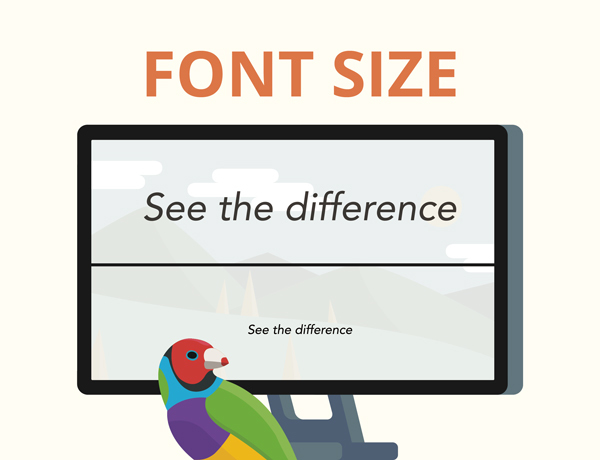 With that in mind, as a general rule of thumb, consider that the font size deemed best for your eyes is roughly three times larger than that of the smallest you can legibly read. While viewing angle and distance are indeed important, the visual makeup of the screen is important as well. Stemming from brightness, this important aspect also includes contrast and resolution. As a general rule, your computer screen’s brightness should be equal to that of the environment behind it. 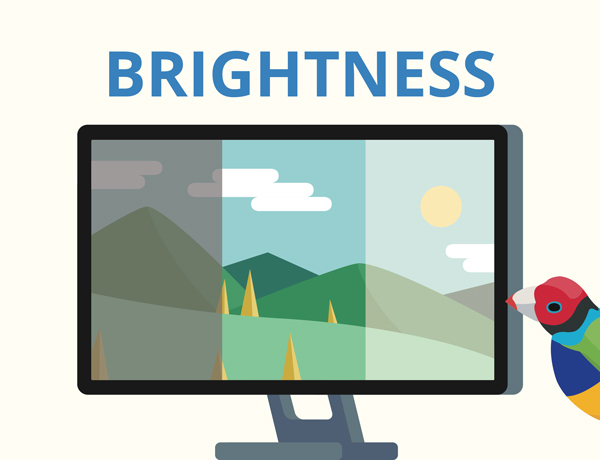 Explicitly, in highly contrasting areas where you’re forced to contend with uneven brightness, you’ll be at higher risk of eye strain, fatigue, and headaches. In order to keep these effects at bay, simply pay attention to how your workstation’s brightness changes through the day, and alter your settings proportionally. While you may not be sitting in a classic hardback chair, or even a swivel or La-Z-Boy, the essence of non-detrimental chair positioning remains rather universal. For starters, your back should be straight, shoulders back, feet flat, and knees at a ninety-degree angle. When sitting in front of a computer for long periods, take care to ensure that your hips are flush with the rest of your body, in order to provide the best support possible. Despite the austere position requirements, the aim is to provide beneficial comfort. Armrests, for instance, may help to relax your shoulders while keeping them in the desired position. Moreover, extra back and seat cushions will help to support the entirety of your back. As we’ve all heard over and over throughout our lives, all of this boils down to maintain good posture. This article by the Cleveland Clinic has some good tips about how to sit correctly and how to improve your posture. A keyboard has a lot more influence than meets the eye. 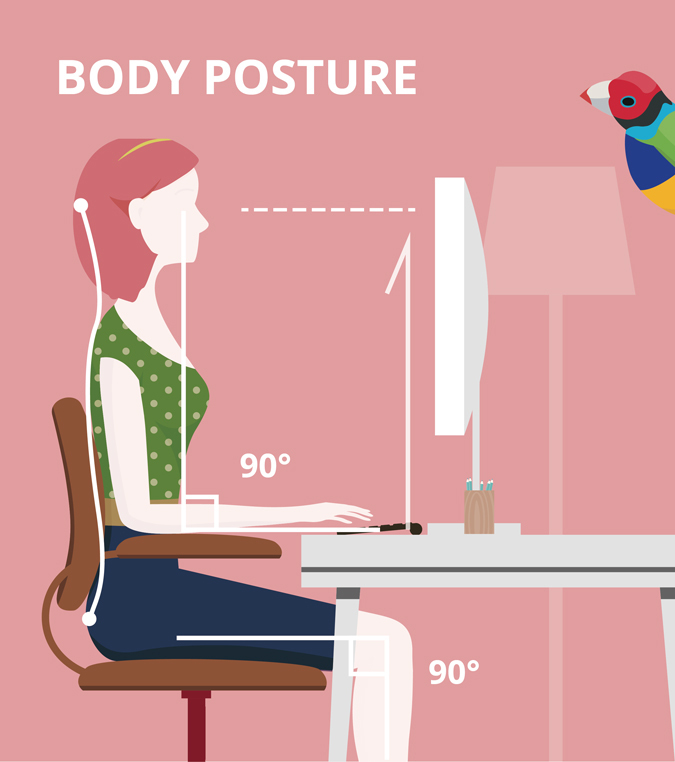 Rather than just being the computer’s input device, it has much bearing on the position of your arms, wrists, elbow, shoulders, and back. To that end, you should do what you can to ensure that your elbows remain beyond a ninety-degree angle’s extension from yourself. To that end, your keyboard should be as close or far away as necessary to achieve such. While an emphasis should be obviously placed on keeping the keyboard in front of you, as opposed to being in some obscure position, you may want to adjust its positioning based on which part of the keyboard you use most frequently. In order to solve this issue, many users opt to use keyboard trays and tilts. 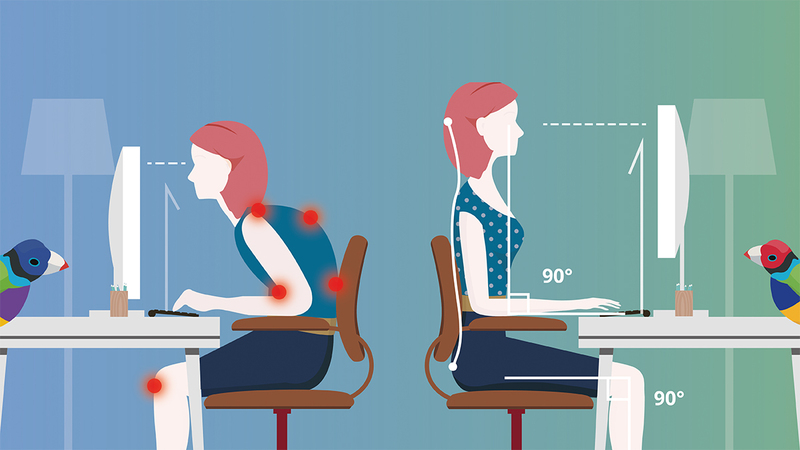 If we’ve managed to catch your attention about the importance of ergonomics, you can read our complete guide to office ergonomics. This guide will help get you on your way to creating a healthier and more comfortable work environment.